The KNPPB, an acronym which bears a striking resemblance with KNPB, was created by Indonesia to further strike a blow at the genuine struggle for Papuan rights, led by the KNPB. The fact that Indonesia would instigate further attacks towards the good image of the political struggle of the people of West Papua was to be expected and it was also predicted. It was only a matter of time before journalists of the newspaper Bintang Papua, a number of which are mere agents of Indonesia, calculatedly published the news item concerning the establishment of this rival organ, based on information passed on by sources who are nothing more than the minions of the Unitary Republic of Indonesia (NKRI), and who have been paid to discredit the struggle of the people of West Papua, a struggle led by the KNPB and the people of West Papua. Active monitoring of the online media shows that Yance Hembring’s group constitutes a faction of the OPM which has already surrendered to the Republic of Indonesia and which is now being used by Indonesia to influence and destroy the bases of the OPM. This faction is now also being used by Indonesia to recruit young people to destroy the KNPB by setting up the rival organ called KNPPB, in exchange for money. The release today of this deceit by the newspaper Bintang Papua (issues numbers 14 and 15) has as main purpose to blacken the good image of the KNPB and to diminish the sympathy of the people of West Papua for the KNPB. Wim Metlama, KNPB’s National Spokesperson, said that Indonesia was resorting to the old ways of paying Papuans and Papuan newspapers in order to play their dirty political games and soiling the good image of the struggle of West Papua. “Treacherous moves like these are not something new. These are old tricks that Indonesia has been using, but it has always been to no avail. And we are convinced that the people of West Papua are wise enough to recognise these dreadful tricks played by the colonisers. Even more so, this deceit only proves once again to the people of West Papua that Indonesia is in the habit of manipulating the truth and lying to the people, and precisely for that reason will they realise that the NKRI is truly an occupying colonial force in West Papua”, said Wim. 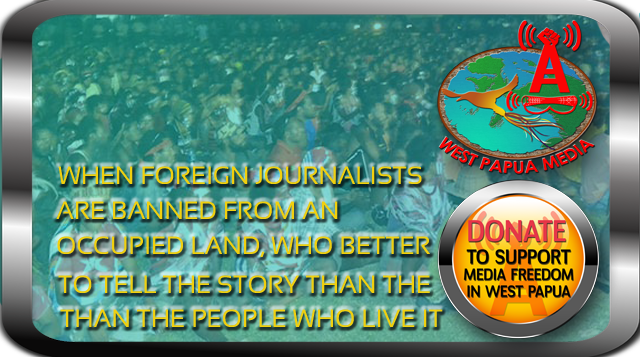 The newspaper Media Papua is unfortunately contributing to the spreading of the lie, by publishing the news item and disseminating the deceitful information into the public in West Papua. According to our monitoring, a month ago, Papua police chief Tito Karnavian had approached the board of editors of the newspaper Bintang Papua and he had asked them for their support for his colonial agenda. Soon, if not already, many agents of the printed media and other reporters in West Papua will be offered money in return for services to support the colonial program as Tito Karnavian has recently requested. Having worked for ten years in West Papua, I fully support the non violent struggle of KNPB (acronym edited by WPM) members and the Free West Papua Campaign. The survival of the West Papuan people is at stake. Last year we were successful in stopping the delivery of Leopard tanks from the Netherlands to Indonesia, showing the film of the violent military ending of the Third National Congress to members of Dutch Parliament. Frank Hubatka, Papuan Solidarity Group, the Netherlands.